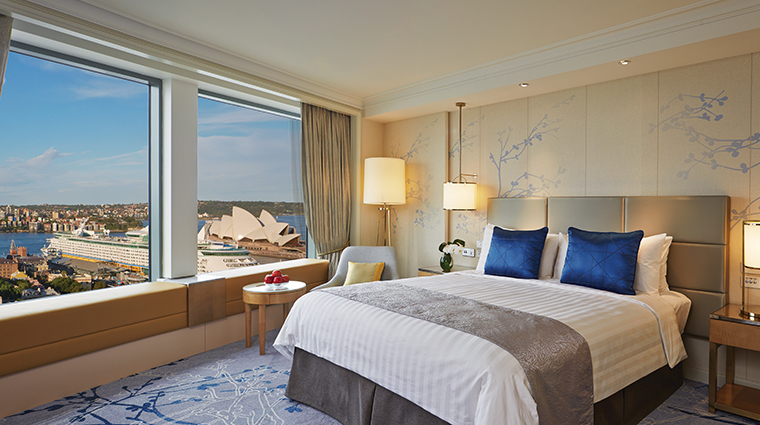 Many hotels along Sydney's harbor feature views of their spectacular surroundings, but none quite like Shangri-La Hotel, Sydney. Towering 36 stories above Sydney Harbour, the Shangri-La stands alone in the city for the highest unobstructed views, boasting the largest windows of any harbor-facing hotel. 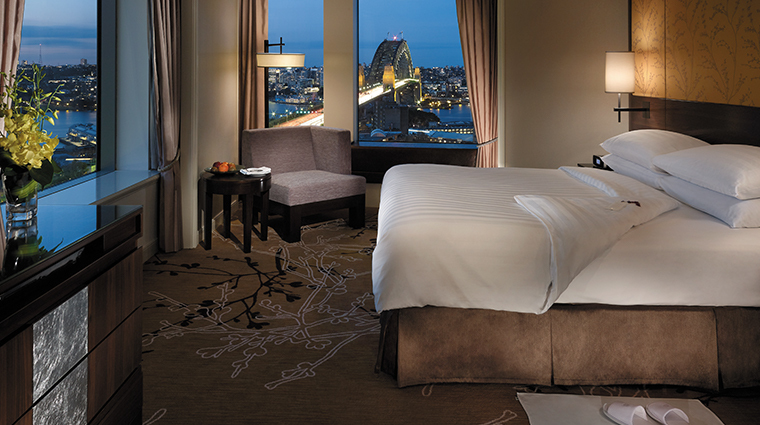 With 270 degrees of sprawling vistas, the hotel gives you a stay complete with a panorama of the city's iconic trifecta — the Harbour Bridge, opera house and Sydney Harbour — as well as views of Darling Harbour, Luna Park and even the Blue Mountains on a clear day. Within the hotel, you'll discover an invigorating spa using some of the purest skincare products in the world by Sodashi, world-class dining at Altitude and Café Mix, innovative drinks from Blu Bar on 36, and an exceptional concierge team headed by Colin Toomey, the international president of the esteemed Les Clefs d'Or concierge association. 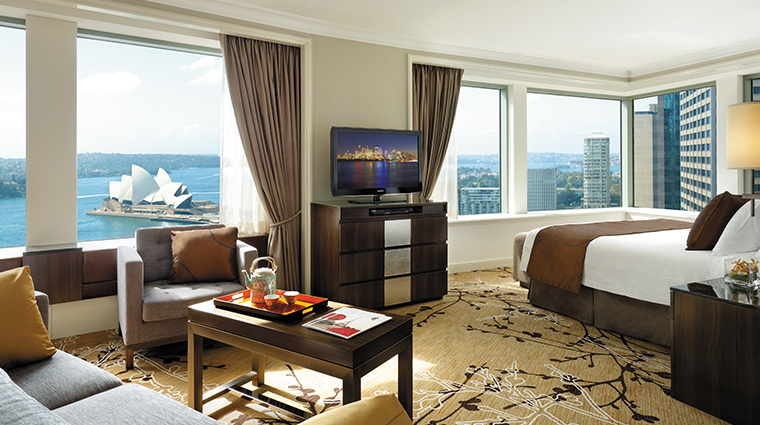 Come for the views, and stay for the luxurious, gourmet and, above all, indulgent experiences at Shangri-La Hotel, Sydney. Respected pastry chef Anna Polyviou heads up all things sweets at the Sydney hotel. She not only creates sweet masterpieces in her arty, deconstructed way, but she also throws sugar-fueled events at the Shangri-La, including the Sweet Street festival and her exclusive Dessert Degustations. An urban oasis, Chi Spa nurtures your physical and mental wellbeing through treatments using Sodashi products, chakra balancing and aboriginal beliefs. Staying fit on vacation will be easy at the hotel's gym with its full range of cardio and weight machines, plus three personal trainers on staff. Get a room with access to the Horizon Lounge. Then you’ll enjoy four-story floor-to-ceiling views of Sydney, breakfast, afternoon tea, evening cocktails and even a game of chess overlooking the harbor below. Throughout the year, the luxury hotel hosts special events for guests and the public ranging from Chinese New Year celebrations, to foodie festivals honoring international cuisines from the likes of the Philippines, India, Taiwan and Singapore. Hotel guests aren't the only residents at the Shangri-La. Urban bees have made a home on the top of the building. Their Sydney-flavored honey can be tasted at Altitude and purchased from the hotel. A lesser-known nook at the hotel, the Lobby Terrace with its signature koi pond is the perfect spot for a peaceful breakfast outdoors. Hidden in the front left corner of Blu Bar is one of the best views you'll find in Sydney. Standing 36 floors above the city, where two floor-to-ceiling windows meet, you'll feel like you're floating in thin air with Barangaroo to your left, Circular Quay to your right and Sydney city below. Look closely at the Horizon Club's architecture. Inspired by the lamp of a lighthouse, the lounge is like a luxurious lantern room and can be spotted far and wide along the harbor. With blues, grays, caramels and tans, the guest room palette brings the outside in, reflecting the harbor's water, sky and sandstone. 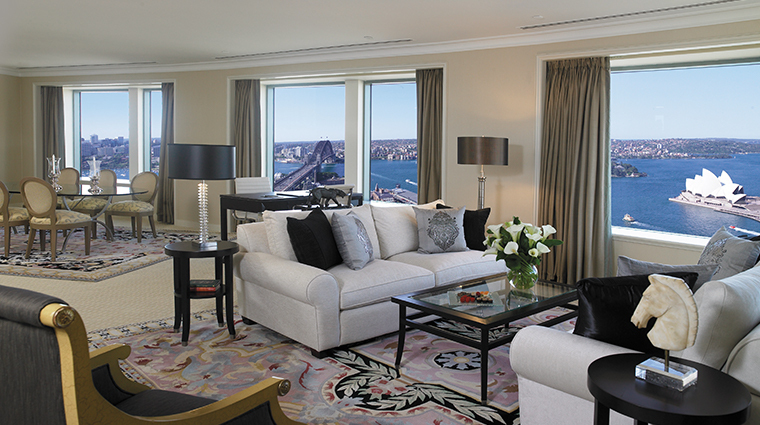 Each one of the hotel's 565 rooms boasts a dazzling view of Sydney and its harbor. All guest rooms feature marble bathrooms with separate baths and showers, pillow menus and signature bed linens. 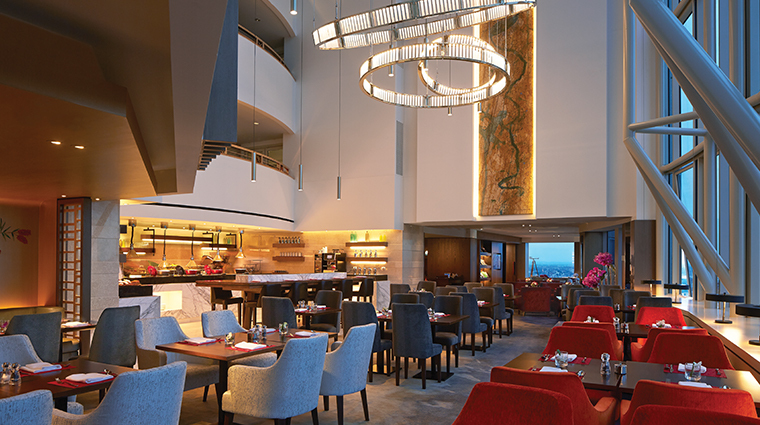 The highly lauded Altitude offers a dining experience like no other in Sydney. Savor the best local produce from land and sea as you look out over the glittering cityscape below. Chef de cuisine Ricardo Ferreira's dedication to seasonal, local flavors is reflected throughout his ever-changing menu of modern Australian dishes with European influences. 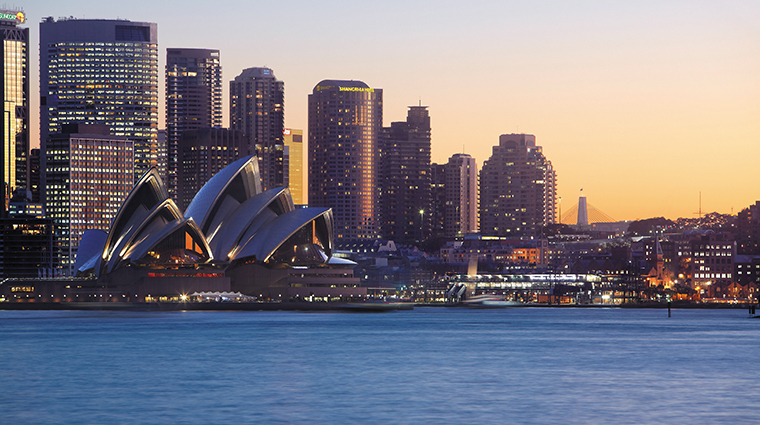 Tour the finest tastes of Sydney and its surrounds on the weekends with the four-course degustation, and during the week with the Epicurious menu and its matching wines from the restaurant's award-winning list. Every seat in the restaurant has a view thanks to floor-to-ceiling windows and mirrors along the walls. For special occasions, book the private dining room. With the beauty of a crystal jewelry box and unparalleled views, the intimate dining space makes for a memorable meal overlooking Sydney.